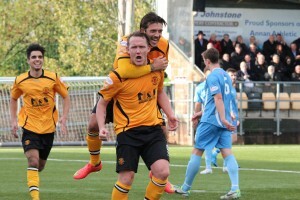 Annan Athletic marched into to the next round of the William Hill Scottish Cup after a stirring second half performance cancelled out Berwick Rangers slender half time lead. It was a game which had plenty of talking points and after a slow start the game came to life in the 28th minute when Smart Osadolor and Jonny Fairburn were both sent off as a result of Smart Osadolor taking a swipe at central defender Jonny Fairbairn who had grabbed Osadolor by the neck. The referee waisted no time in sending the Annan player to the changing room and after a consultation with the road side linesman Fairburn also got his marching orders. Annan forced several corners in the opening 10 minute spell but for all their territorial advantage at this period in the match Annan failed to test Kevin Walker in the visitors goal. Gilfillan conceded a free kick in an inviting position in the 12th minute following a hefty challenge on Henderson. Darren Lavery’s well struck free kick tested Annan keeper Jordan Hart who dealt positively with the effort. A promising Berwick move in the 20th minute ended with Lavery being blocked by a host of Annan defenders. Minutes later Finn Graham headed over from a corner as the Borderers threatened the Annan goal. The sending off incident was followed minutes later in the 32nd minute by the opening Berwick goal which followed a corner kick and Dwayne Coultress’s low shot from 12 yards went through a host of players before nestling in the corner of the net via the base of the post. Annan were denied by the cross bar in the 35th minute when Ryan Finnie’s cross was met by Rabine Omar who’s effort struck the top of the cross bar. It was a rare scoring opportunity in an otherwise frustrating and dull first half for both teams who produced very little excitement for both sets of supporters. Annan forced the play at the start of the second half, Ryan McStay was introduced in the 60th minute in an effort to add more cutting edge to Annan’s mid field play. Annan’s equaliser in the 63rd minute was a moment Berwick will want to forget when Ross Graham bundled Gillfillan to the ground and the referee was well placed to award Annan a penalty which Weatherson converted with a powerful shot down the middle. The goal gave Annan a lift and moments later Josh Todd scored what appeared to be a well constructed goal when he latched on to a through ball but the goal was chalked off for an infringement on Ross Graham. It was however a warning for the Borderers as Annan were looking very dangerous as they stretched the Berwick defence particularly down the right and it came as no surprise when Annan went ahead in the 70th minute. Martin McNiff created the goal with a looping ball played down the right and Todd picked the ball up to finish with a superb strike into the roof of the net. Rabin Omar squandered a clear chance in the 75th minute when he blasted the ball against the keeper with the goal gaping. It was one way traffic as Annan went all out to finish the game and in the 81st minute Wetherson scored the goal of the game when he collected Flynn’s intricate pass to finish with a low shot past the stranded Kevin Walker. Annan continued to push forward and in the 84th minute Wetherson set up Rabin Omar who finished with a low raking shot into the net from 12 yards. Berwick were being torn apart at ease and Annan squandered several more opportunities to add to their talley before the referee blew for full time. It was a tricky tie for both clubs but on this occasion Annan’s second half performance more than justified their place in the next round of the William Hill Scottish Cup. Annan have now gone eight games undefeated at Galabank and the team have scored in every match they have played. The squad are developing into a unit which are extremely difficult to defeat. Who could have imagined a couple of weeks ago that Annan without the services of Black, Swinglehurst and Watson would have gone into this game and won so convincingly. There is real competition for places in the starting line up, the introduction of Gillfillan now gives the manager more options and for the time being Annan are in a good position. They now face 2 difficult away SPFL League 2 matches at East Fife and Elgin City, two clubs very much in contention for the play off places and it is important that Annan in a way don’t get distracted away from the slight advantage that they currently hold at the top of the league. ANNAN ATHLETIC: Jordan Hart, Bryan Gillfillan, Ryan Finnie, Martin McNiff, David Ferguson, Steven Sloan (Ryan McStay 60 min), Rabin Omar , Mathew Flynn ( Greig Macdonald 88 min) , Peter Wetherson ( Stuart McColm 85 min) Josh Todd ,Smart Osodalor. SUBS NOT USED: Blair Currie , Steven Swinglehurst, Scott Norman, Jamie Watson. REFEREE: Gavin Duncan . Assistants Ross Haswell and Steven Strang.